Questions that bothered us so…. When and Where does the Club meet monthly? 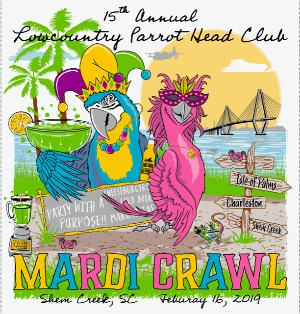 The Lowcountry Parrothead Club meets on the 3rd Tuesday of every month at Red’s Icehouse on Shem Creek at 98 Church Street Mount Pleasant, SC. Meeting starts at 6:30pm, but feel free to come early, grab a bite to eat, check out the great view and socialize! Head over to our Membership page by clicking here. There are options to join either online or by mail! Yes. They’re $25 for an initial single membership and $35 for an initial couples membership. Yearly renewals are $20 for singles and $30 for couples, due in July of each year. Where can I get a membership form? Print the current membership form from here: Membership and mail it in! Ok…I joined!! When do I get my free front row tickets? Will Jimmy be at our next meeting?? No and no…. Even though we are sometimes allotted tickets to area Jimmy Buffet concerts, we still have to pay full concert price and seats are pre-assigned and available only to members in current good standing. Ticket sales to members are based on a point system. Members who attend meetings and participate in club events are given certain points. Those members who have the highest points are offered tickets first. If they decline the offer, then the tickets are offered down the list. How do I keep up with club news and events? We have a couple of different ways of communicating to our “phlock”. ~Our primary communication within the club is done through our Yahoo Group, which is open to join by all members in good standing. ~You can bookmark this website to keep in the loop, which we try to keep up to date as much as possible.